The actual colloquial phrase is bol bachan for someone who is capable of just talk no action...as in “Arre don’t listen to him, he is just a big bol bachan.” Making it Bachchan, and having Abhishek star in it, is a tribute to the real superstar, who pops in to kick start the movie with a song. Rohit “I don’t care for critics” Shetty has been delivering hits, but giving his full decibel, crashing cars and garish colours treatment to ideas that are picked from other films, mostly without acknowledgement. Bol Bachchan is an official remake of Hrishikesh Mukherjee’s comedy classic Golmaal, the title of which Shetty has already lifted for his own brainless franchise. Official in the sense that the rights have been purchased, after that Shetty has run over the charming comedy about simple folk with a large bulldozer and flattened it into a witless farce about idiots. The original started with a harmless but necessary lie: a man bunks work to watch a match, is spotted by his strict, moustache-loving boss, and comes up with the impromptu lie, that it was his mouche-less, feckless twin. In Bol Bachchan a whole lot of contrivances lead to this point. Abbas (Abhishek Bachchan) and his sister Sania (Asin) lose their home after a long court case and are invited by their father’s friend Shastri (Asrani) to go with him to Ranakpur. In this Priyadarshan-like lala-land, still feudal and cop-less, Prithviraj (Ajay Devgn) is the uncrowned king, the kind of man who whips an employee to within an inch of his life for a small error in accounts and then takes him to hospital for treatment. He is a wrestler, surrounded by a bunch of fat men and a weasely sidekick (Neeraj Vora.) 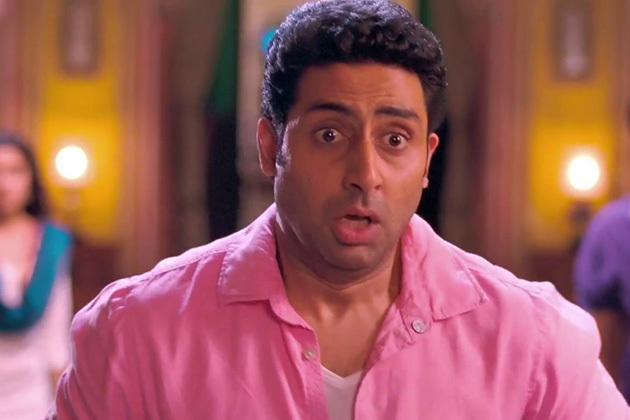 In this Ranakpur, when Abbas breaks the lock of a disputed temple to save a child, his friend Ravi (Krushna Abhishek) prevents a communal situation by blurting that the good samaritan’s name is Abhishek Bachchan. He is hired by Prithviraj and quickly gains his trust. But when he is spotted an a mosque, he has to come up with a pansy-ish, lookalike half brother; the tower of lies builds up with the invention of amother, the hiring of a nautanki dancer (Archana Puran Singh) to play the role, the ancient gag about two other fake mothers turning up, and Abbas having to cook up more and more fabrications,which the innocent Prithvi believes, since he had a sweetheart who was a deadringer for Sania. To give Abbas a love interest, there’s Prithvi’s sister Radhika (Prachi Desai), and to enable some furious Shetty fight scenes with flying stuntmen and cars, a nasty cousin is introduced, who kidnaps Radhika twice! The beauty of the original Golmaal lay in its believable characters and effortlessness performances; in Bol Bachchan, the actors huff and puff so much to extract laughs that they all but blow the house down. If Abbas has to play an over-the-top gay, Prithvi speaks gibberish like “I will remember you milk number 6.” (Translated from Chhatiki doodh yaad dila doonga.) And what is to be said about the climax that is so clichéd that it is painful to watch. Luck has been with Rohit Shetty so far, so ‘timepass’ seekers might just turn this one into a hit. He might get into the 100 crore club, but he will never come close to Hrishikesh Mukherjee’s genius.